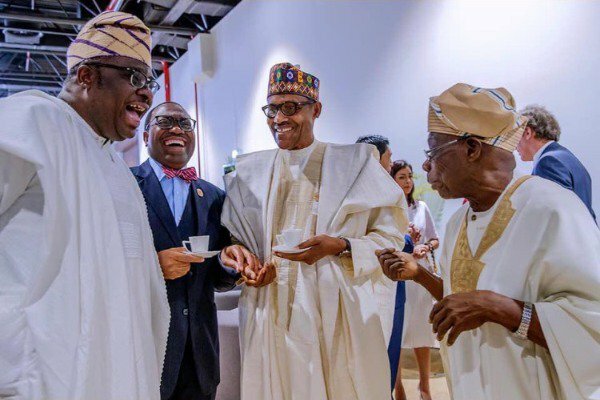 President Muhammadu Buhari and former president Olusegun Obasanjo were all smiles on Thursday when they met in Senegal. The duo met at the inauguration ceremony of President Macky Sall of Senegal in Dakar. Nigerians were fighting bcus of Obasanjo and Buhari. Their friendship is renewed on daily basis while the poor people carry their case for head like gala seller strucked in the traffic . They met indeed, how come they are wearing uniform. APC organised everything and they will still lie. Obj the world's number one hypocrite and self-interest pursuer. When he still used to hold the African leadership forum at his otta farm, inviting people like Andrew Young and other principled men of god standing, one would think if he ever becomes president he will demonstrate exemplary leadership, but no way those men now saw his true color.